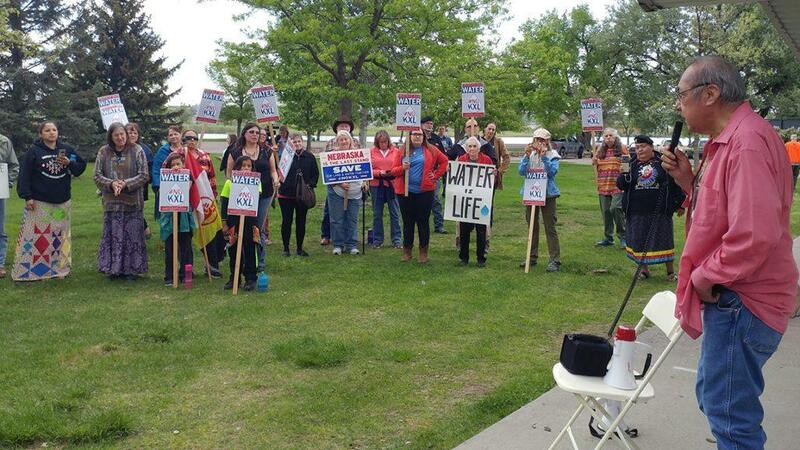 Keystone XL opponents gather in Great Falls, MT, Wednesday, May 23, 2018. 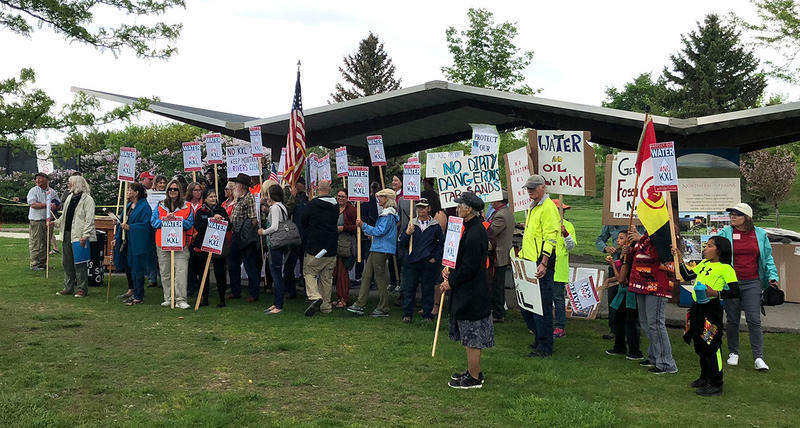 Opponents of the Keystone XL oil pipeline gathered at Riverside Park in Great Falls on Wednesday in support of environmental and indigenous justice groups suing the U.S. government in federal court to stop the pipeline. The lawsuit, combined by U.S. District Judge Brian Morris from two similar suits, claims the U.S. Department of State and the Bureau of Land Management violated federal environmental laws when the Trump administration resurrected Keystone XL in January 2017. 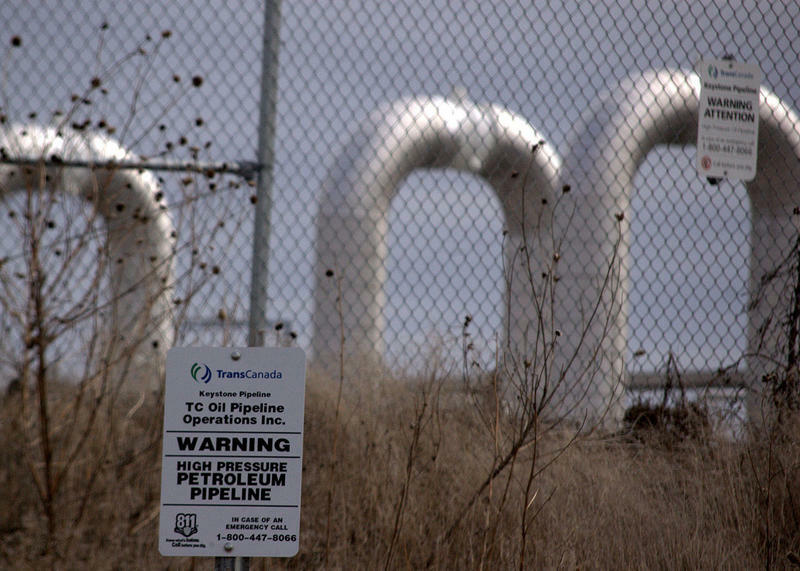 Former President Barack Obama in 2015 denied Canadian company TransCanada a permit to build the pipeline over environmental concerns. The plaintiffs in the lawsuit — including Northern Plains Resource Council, the Billings-based group that organized Wednesday’s rally — are asking the court to revoke crucial permits the State Department and the BLM granted TransCanada until the company files an updated environmental impact statement. The most recent EIS is from 2014. 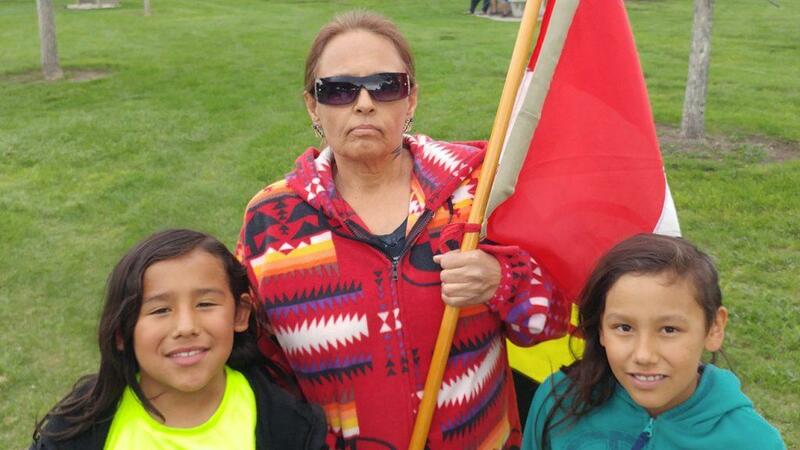 Great Falls resident Debbie McShane, 61, president of the American Indian Movement in Montana is Lakota by way of Pine Ridge, S.D. McShane has been with AIM since its formation in 1968. McShane was too young to take part in the three-month occupation of Wounded Knee in 1973, but she sent water protectors and supplies to the nearly year-long protest of the Dakota Access Pipeline at Standing Rock in 2016-2017. In addition to the climate change and wildlife concerns the plaintiffs outline in the lawsuit, opponents say Keystone XL’s proposed crossing of the Milk, Missouri and Yellowstone rivers would threaten drinking water for tens of thousands of farmers, ranchers and tribal members in remote Northeast Montana should the pipeline leak. “There’s only two types of pipelines, the ones that are leaking and the ones that are going to leak,” said Dena Hoff, a Glendive farmer on the Yellowstone River, NPRC member and plaintiff in the lawsuit. In January 2015, Hoff returned home from a weekend in Billings to see emergency lights strobing below her sheep pasture. Hoff said she had heard an ice jam caused an oil spill, and at that point she knew exactly where the Bridger Pipeline had ruptured. According to Hoff, Tap water throughout Glendive smelled like diesel fuel, and, Hoff said, residents were potentially exposed to carcinogenic benzene for four days until the Environmental Protection Agency realized the town’s water intake on the Yellowstone River had been contaminated, and shut it down. Hoff is 71, and the Bridger Pipeline spill wasn’t her first experience with contaminated water. She said she grew up in Belfield, North Dakota, close to the Montana border, where she and other kids swam in pools of uranium waste water dumped from local mines and processors. Hoff said she has been cancer-free her whole life, but she said two of her uncles died at the age of 59 from lung cancer. Hoff moved to Montana in the 1980s, joined the NPRC, and watched the Bakken oil fracking boom further pollute her old home. When the Bridger Pipeline broke in 2015, it was the final straw for the Assiniboine and Sioux Tribes of the Fort Peck Indian Reservation in Montana’s northeast corner. The region’s aquifer was contaminated by carcinogenic compounds and saline during 20th century oil booms that saw little economic benefit to the tribes. Some residents were forced for decades to drink bottled water. In 2000, Congress appropriated $300 million for the Assiniboine Sioux Rural Water Supply System to supply the reservation and nearby white communities with drinkable water from an intake plant on the Missouri River, which marks the reservation’s southern border. The system was operational across the region by 2015. When the Tribal Executive Board saw what happened to Glendive’s drinking water, they passed a resolution opposing the Keystone XL pipeline, which crosses the Missouri upstream of the ASRWSS intake plant just west of the reservation’s Milk River border and right below the spillway for the Fort Peck Dam, which holds back the fifth largest reservoir in America. Northern Plains testified before the Montana Land Board in 2012 that flooding the previous spring had scoured the riverbed right where Keystone XL is to be buried, but the board, led by then-Gov. Brian Schweitzer and four other Democrats, voted 5-0 to grant TransCanada right-of-way on state lands. The Fort Peck Tribes have not joined the lawsuit against the federal government, but Bill Whitehead, chairman of the water system board, spoke out against the pipeline and its threats to the Tribes’ water at Wednesday’s rally. Whitehead said the water intake plant was never designed to filter out the tar sands crude Keystone XL will carry. Bill Whitehead, chairman of the Assiniboine Sioix Rural Water Supply System board, says the Keystone XL pipeline tar sands threaten the drinking water of tens of thousands of people on the Fort Peck Indian Reservation and in adjacent communities, as it crosses the Missouri upriver of the water system’s intake plant. The $300 million dollar system was created by Congress after the oil industry turned the local groundwater carcinogenic and saline. After speeches from Hoss, Whitehead and other plaintiffs in the lawsuit, about 30 people holding signs and shouting slogans marched alongside the Missouri River toward the River’s Edge Trail pedestrian bridge leading to the federal courthouse on the river’s west bank. Half a dozen vocal teens spontaneously joined the procession as it passed a skatepark. Beyond a handful of other teens who briefly shouted “Trump” at the marchers as they crossed the bridge, there were no counter protesters. Visible a mile downriver from the bridge sits the Calumet Specialty Products Partners oil refinery, where in 2016 a $450 million investment — the largest in Cascade County’s history — doubled its crude oil output and enabled the processing of the same Alberta tar sands Keystone XL is slated to transport. From Calumet, trains of oil tanker cars roll up the Missouri’s far bank to the BNSF rail yard on the south side of the bridge, and onward to terminals on the West and Gulf coasts. The danger posed by these “bomb trains” is one of the few things environmental groups and pipeline companies agree on, though while TransCanada touts Keystone XL as a safer and necessary alternative, the Natural Resources Defense Council (one of the plaintiffs suing the State Department) says tar sands are dangerous no matter what. Hunter Pauli is an award-winning freelance reporter based out of Missoula, MT. He has reported for the Montana Standard in Butte, the Missoula Independent, and the Montana Native News Project. This story comes courtesy of The Montana Free Press. 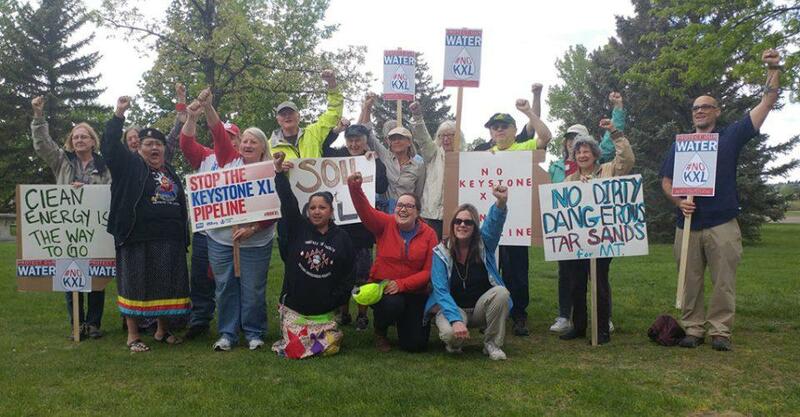 Protesters are marching in Great Falls this evening to rally opposition to the proposed Keystone XL pipeline. The event was organized by groups suing in federal court to overturn the Trump Administration's presidential permit for the pipeline to run from Alberta, Canada across Northeast Montana, down to Nebraska. "Oh yes, we’re lambing. It’s been crazy," Hoff says. 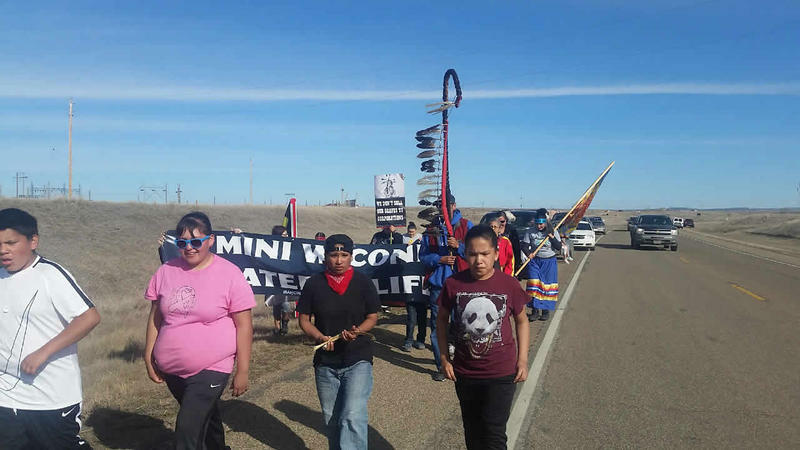 Hours before the Trump administration issued permits to resurrect the Keystone XL pipeline Friday morning a group on the Fort Peck Reservation in northeastern Montana set out on a prayer walk to protest the pipeline.